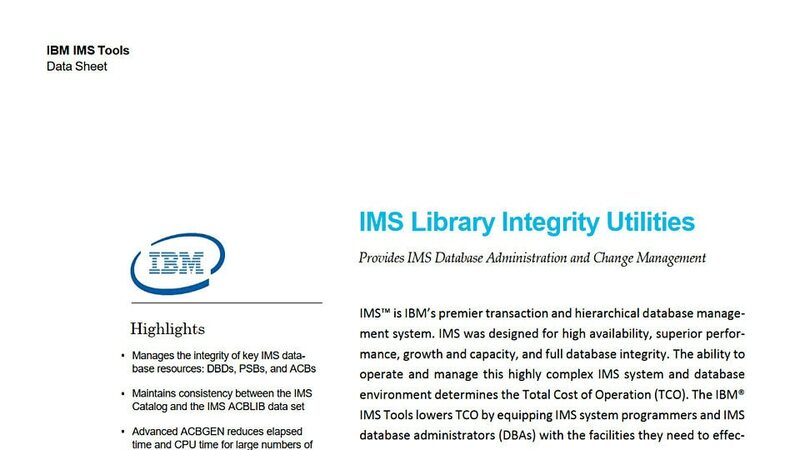 IMS™ Library Integrity Utilities for z/OS® helps to validate, compare, map, recover, report and regenerate many IMS libraries needed for operations. It ensures the ACB (Application Control Block), DBD (Database Description), PSB (Program Specification Block) and MFS (Message Format Service) libraries are consistent and have full integrity. IMS Library Integrity Utilities for z/OS can map and compare database control blocks in these libraries and can recreate source members from compiled control blocks. There is also a sophisticated graphical user interface that shows the relationships between the IMS database and program definitions. Avoid corruption caused by using an incorrect database description (DBD). Confirm that all definitions in an IMS subsystem necessary for database operations are in place. Compare applicable libraries and reports on any differences between them. Regenerate and recover source control statements for library members. View and work with a graphical representation of library members. Replace the standard IMS-provided Application Control Block (ACB) generation utility with a high speed generation facility.